Kait, Renata, and their guest Ryan Sandoval (author of The D.A.D.D.Y. 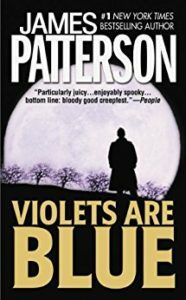 Complex) read Violets Are Blue, the 7th book in James Patterson’s Alex Cross series. Intrepid detective Alex Cross investigates vampire-themed murders, as well as the body of every female character in the book. Join us as we sort ourselves into the four fetish houses: leather, rubber, Goth, and Victorian. Candy pairing: Kait says Hershey’s kisses, Renata says a mixed bag of candy, Ryan says novelty wax fangs. Coming up next: The Chemist by Stephenie Meyer.